We have been dry cleaning for nearly forty years and we have dry cleaned every type of wedding dress you could imagine. The equipment has modernised and the processes we use are very gentle on fabrics and embellishments. Our dry cleaning service is very gentle fabrics on but very tough on stains. We understand that a wedding dress is extra special and over the years our experienced staff have refined the process down to a fine art. Your wedding day is one of the biggest days of your life and we want you to remember that day even when all the celebrations have passed. One of the most important ways to care for your wedding dress is to have it professionally cleaned as soon as possible after your wedding day. Even though every bride is very careful, it is practically impossible to avoid getting stains on your dress on the big day. Wine, champagne, a splash from the dinner table or even just getting your outdoor and indoor photos taken can all have an impact. The best thing is not to let those stains dry in over a long period of time. We have years of experience in cleaning wedding dresses and we know what works. What better way to remember your wedding day than to have your dress professionally cleaned and preserved in materials that are specially designed to care for your dress. At Gills Dry cleaners our experienced staff will examine your dress and give you guidance on the best way to care for your dress. We are fastidious when it comes to garment care and especially so when it comes to wedding dress care. We know that wedding dresses are delicate and also that there may be numerous different materials used in its design. Some wedding dresses come with embellishments that need extra care to prevent damage. We listen to any concerns you may have and explain in detail our cleaning process. We can clean your dress and hand it back to you in the same pristine condition as the first day you laid eyes on it. Once your wedding gown is received and examined by us we will contact you to discuss in detail how we will prepare your dress for cleaning. Once you are happy with our preparation we then clean your dress in our state of the art dry cleaning systems. We are conscious of how delicate materials are and we only use the gentlest of processes to clean your dress. Our staff examine your dress at every opportunity to make sure all stains have been removed. It is only after the dress has been thoroughly examined and cleaned that we are ready to carefully place your dress in our specialist packaging materials. We have two services available for cleaning your wedding gown and bridal wear. All our gowns go through our first service which is vary careful inspection, care and cleaning process before being delicately place in our packing materials for collection or delivery. 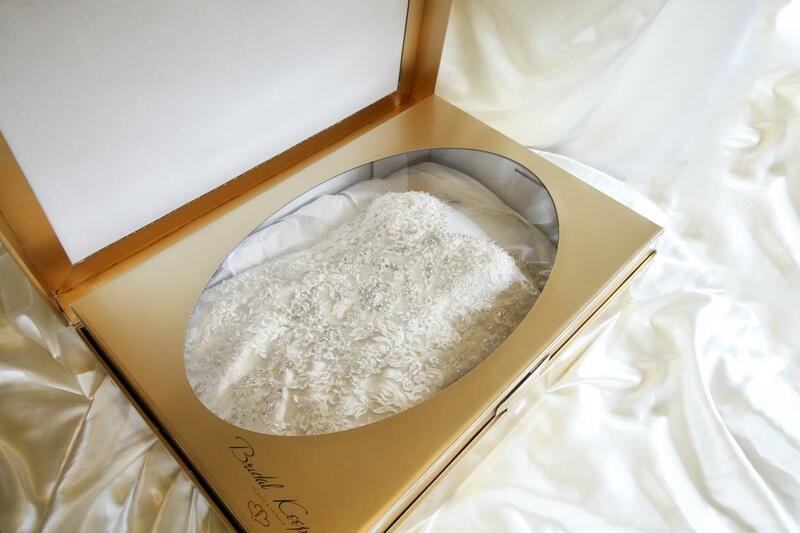 The second service is an addition to the cleaning where the bridal gown is placed into a special presentation box. Our materials have been specially designed for packing and presenting bridal wear. It has gone through a strict manufacturing process to make sure all the materials used are acid-free and are capable of preserving your dress for a long time into the future. 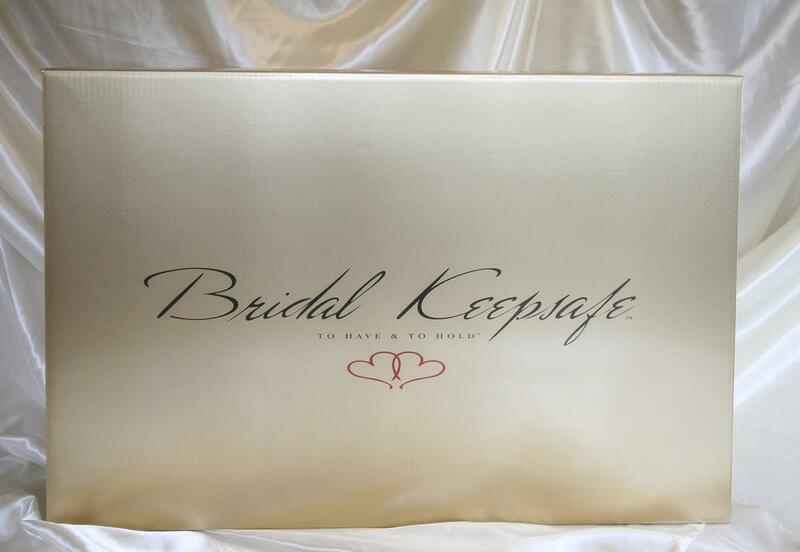 Our presentation boxes and packaging have been specially designed to care for your wedding dress. They are acid-free and are specially manufactured for wedding dress care. Your dress is specially prepared so that the dress when placed in the box holds its shape and form to simulate the form of the bride. The front of the display box has a large display with a protective layer of see-through film. This allows you to happily present and show off your dress to friends and relatives and at the same time making sure it suffers no damage form sticky hands or any harsh environment. The presentation box is then placed inside another protective layer of packing for delivery or collection. Gills Dry Cleaners offer great value for money while still giving our customers a speedy service. We understand how peoples lives are very busy and are conscious of having an efficient service where your laundry is ready when promised. Customers rely on us for a professional service which we always deliver. Our Bridal Gown service is available in any of our three shops across the region in Westport, Ballina and Castlebar all based in County Mayo and in our Dunshaughlin shop County Meath. You don’t have to live in the locality to avail of the Bridal Gown Service. We can accommodate you where ever you live in the country. If you live close by you can drop into any our shops or call us and we will arrange to pick your dress up by courier and when we are finished deliver it straight back to your door. If you are going to use our courier service there are few steps that you need to go through before you send off your gown to us. We want to make sure that your dress arrives to us in perfect condition. The best thing you could do is to make sure that your dress is as clean as possible before you ship it to us. If there is any loose surface dust or dirt just gently remove them. Remember don’t use any liquids, chemicals or any kind of force to remove stains. If in doubt leave it to us and we will make sure that no damage is done to your gown. Place the gown into its protective dress cover if it has one and then place that in a cardboard box with plenty of soft bubble wrap. Don’t use newspaper or any kind of coloured packing material as contact with the dress could cause it to stain. You can drop your gown into any of our shops in Westport, Ballina and Castlebar all based in County Mayo and in our Dunshaughlin shop County Meath or we will arrange to send a courier to you to collect the gown if you are not close by. Don’t forget to include your name address and telephone number with your gown and if you can, your Eircode details. This allows for easier transportation with the courier when the dress is returned. Once your gown arrives and we have examined it we will contact you and let you know when your dress will be ready for collection.